In our popular post on “Dispatch vs Despatch” we questioned whether its (not it’s!) usage was a historic anomaly. Some have questioned, indeed, whether it was “an historic anomaly“. 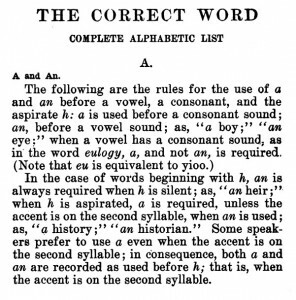 The usage of ‘A‘ versus ‘An‘ before words beginning respectively with a consonant or a vowel should be fairly straightforward. What if, however, the word begins with a silent ‘h’ (Aitch) or the word following that, which it qualifies, begins with a vowel? The French homme is pronounced ‘omme but English ‘home’ is pronounced howme, unless we’re talking about being on our way ‘owm now. History and historic lead with an ‘h’ but many speakers pronounce them ‘istory and ‘istoric. It’s (not its) enough to give one an ‘ernia, though Hermione would say ‘hernia’. 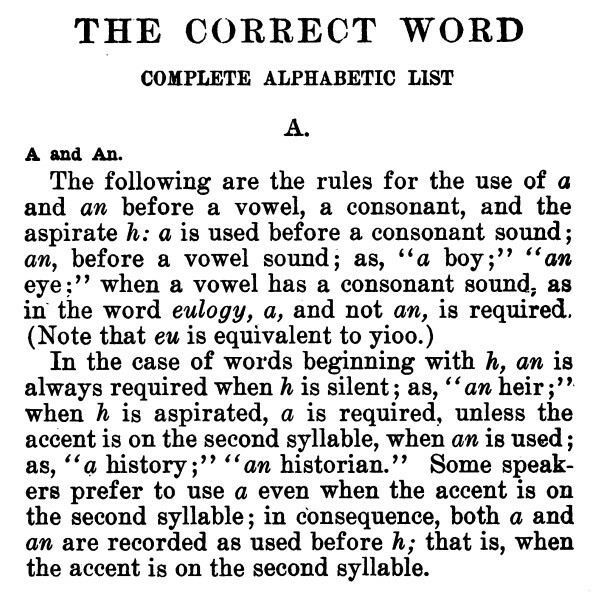 Some, therefore, base the usage of ‘a’ and ‘an’ on pronunciation and not spelling. What sounds best in speech may not be what looks best written when it is not aspirated out loud. A house or an house? A heir or an heir? Now, those are easy ones, but what about happy, hereditary, historic, hotel, hungry, or, as cited by Fowler, hysterical and habitual? Nearly ninety years later and his prophecy that it would “no doubt disappear in time” has not come to pass, or else we would not be having this discussion and people searching Google for grammar tips and writing style rules. 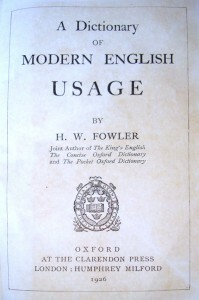 Fowler was, of course, most emphatically, not a pedant – which might explain why the 1926 first edition was reprinted in 1930 and 1937 “with corrections“. Baker, Josephine Turck, The correct word – A and An. As Bill Walsh, Copy desk Chief at The Washington Post and author of “Lapsing Into a Comma“ points out, “things appear to have evolved“. a or an before H? Use an before a silent H: an heir, an hour, an honest politician, an honorary consul; use a before an aspirated H: a hero, a hotel, a historian (but don’t change a direct quote if the speaker says, for example, “an historic”). a/an: an hour, heir; a hotel, historian (if the H is pronounced, use A). 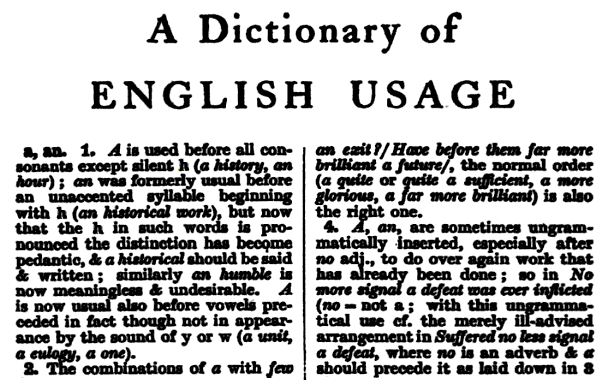 If you speak and write British English, you can probably keep using an before historical, hysterical, habitual, etc. 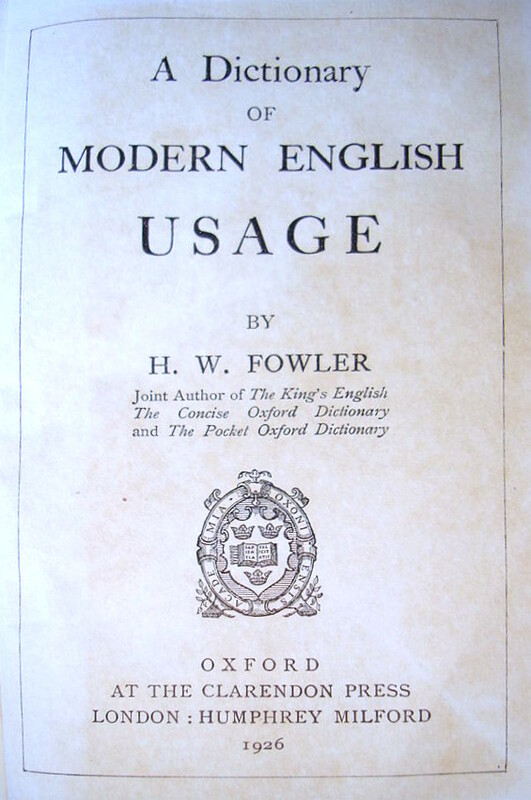 I doubt that you will be challenged by your own countrymen, and if Americans challenge you, just point out that British usage and American usage often differ. If you are American, you probably should use a rather than an, even in a historic occasion or a historical reference. Most of us are comfortable with a historic occasion, because the word historic has fewer syllables than historical, so the h is more fully pronounced. But if, like me, you are old enough to find a historical reference a tad uncomfortable, then go ahead and say an historical reference.